Halong Bay is one of Vietnam’s most photographed sights and this overnight tour from Hanoi offers a rare chance to experience it from both air and water. 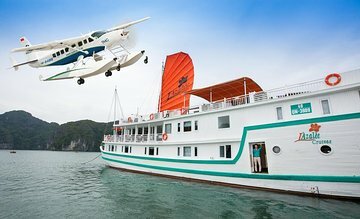 Soar over the UNESCO-listed landscapes in a seaplane; spend a night at sea on a traditional junk boat; then cruise around the caves and islands, stopping to swim, snorkel, and kayak. Tour includes on-board accommodation and meals. Simply unforgettable! Halong bay is an unique place to discover. The tour delivered everything that was offered. We decided to go to Halong bay from Hanoi by sea-plane and back by bus. If money is not an issue, I do recommend the sea-plane in both directions. Boat accommodation, meal, and crew was superb! So I do recommend this tour and would love to go back for a longer stay a 2-night cruise maybe.